This is why I don’t understand why people pay to ride stationary bikes in windowless gym basements. Risa and I rode the 22 km from downtown Peterborough to Omemee this weekend via an old railway that’s now part of the Trans Canada Trail. 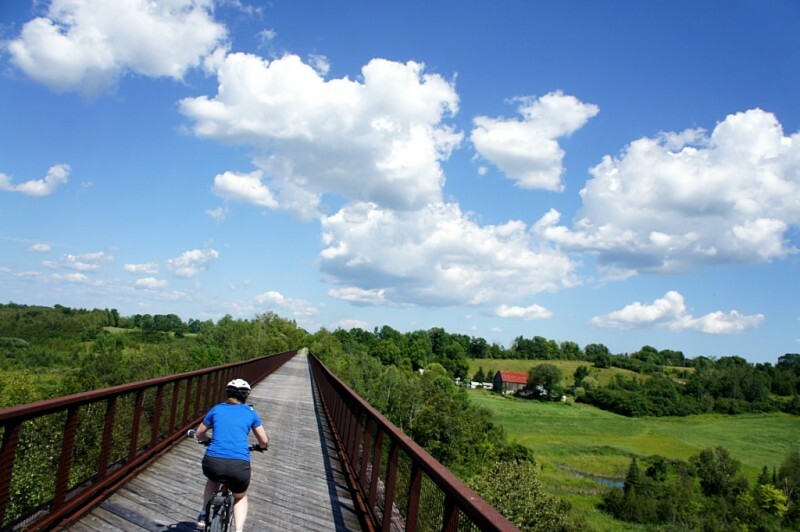 Starting from its origin in Peterborough, this rail trail runs between backyards and along a small stream before quickly leaving the city, pavement, and crowds behind on the way to Omemee and beyond. It has everything you’d expect along the way: scenic vistas, a well-maintained gravel bed, planked-in bridges and trestles like the one shown above, and an utter lack of traffic and hills. 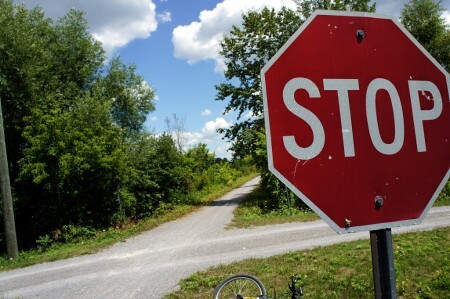 The trail continues past Omemee to Lindsay, where you can connect to other trails that will take you to Uxbridge, Fenelon Falls, or all the way up to Haliburton. The trail is an easy and relaxing ride for the entire length. It passes a few rural intersections and driveways at grade, while busy Highway 7 and some other driveways are carried over the trail on bridges. The urban intersections in Peterborough are similar to the ones on Toronto’s Beltline, but have curb cuts to actually let cyclists cross at the trail. The trail itself is well-maintained and can be ridden by the most casual of cyclists. Along the way you are treated to views of farms, valleys, and the rolling hills that you are not constantly climbing up and down. That’s the real joy of rail trails: you may be climbing, but the grade is so slight that it doesn’t hurt when you’re going up and it’s like having a slight tailbreeze when you’re going down. Check out the short gallery with some of the sights along the way after the jump.